The Happiest 5k on the planet took over Dodger stadium this weekend, with thousands in attendance to participate in the colorful 5k race. Somehow through the energetic crowd, and immense amount color smoke clouds, we spotted VH1’s Basketball Wives star Draya! Draya isn’t usually known for being a sociallite on the fitness scene, but this 5k was the perfect place to make an appearance! If you happened to take a glance at her instagram page you can see why. The former reality star posted fun pics of her drenched in color alongside her team of girls, naming her team after her swimsuit line “Mint SwimWear”. Draya must know a thing or two about making fitness fun, because putting your firends and a fun race together makes the perfect recipe for making the most of burning calories. 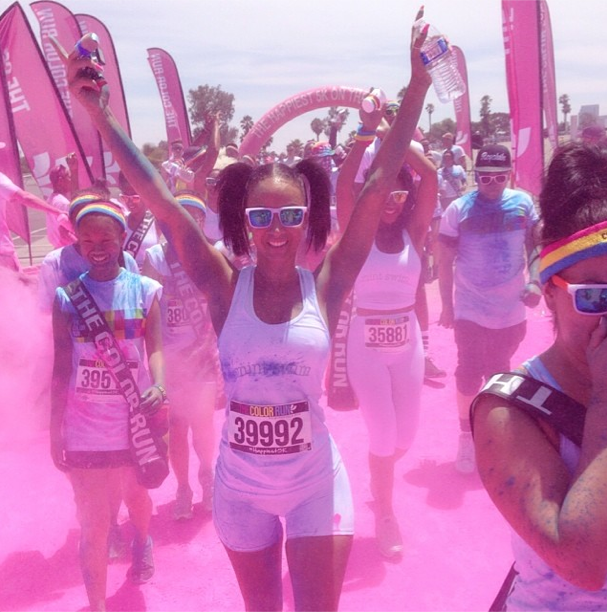 Check out her fun instagram pics and 5 reasons why the color run should be on your fitness to do list. 1. Your having so much fun, you forget your working out. With all the music, color and fun things to do pre and post race, you will definitely forgot that you just burned tons of calories. 2. A 5k is only three miles. Although it sounds like a lot, a 5k is only three miles, meaning wherever you are in your fitness journey, beginner or advanced, you can do this race. The best part, it is not timed. So you can run, jog, walk, or dance. 3. Instant Motivation. Once you get this notch under your belt, your automatically going to think whats next? A mud run,an obstacle course, the NY marathon? 4. Run for A Good Cause. The color run is a for profit organization but, you can team up with them and your favorite charity. Literally team up with them, and your favorite charity so you and your friends can run for a good cause. To participate in a Color Run near you click here. MTV VMA’s: Fit or Flop? Burn 300 Calories In No Time!